The tool you have come to rely on is now mobile. 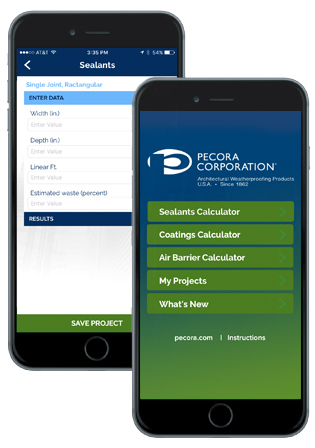 Pecora Corporation Sealants and Coatings Calculator is a fast, simple way to estimate the amount of coating or sealant you need for your next project. With the My Projects section you can easily save calculations on new jobs and review past information – your project data is always with you. You can also send job data via email, text message, or other available options on your device.